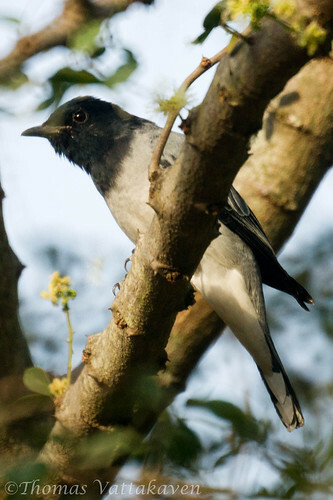 The Black-headed Cuckooshrike (Coracina melanoptera) is a medium sized grey and white bird, in open country sides with good tree growth. 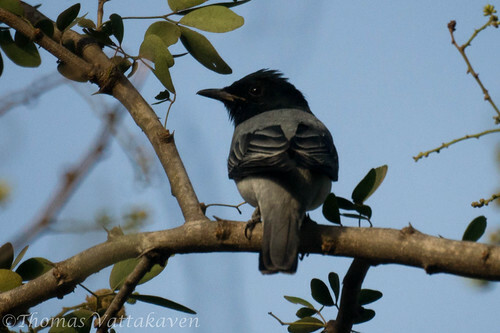 The male has a black head and upper breast with dark grey upper plumage. 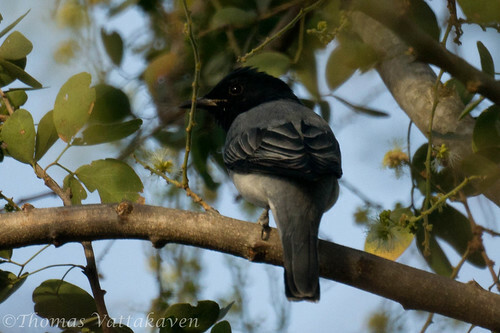 The wings are also black, with the grey or white margins on the flight feathers. 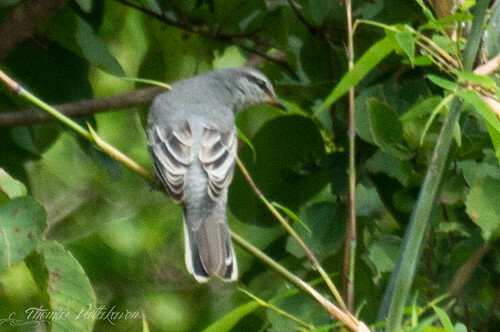 The tail is blackish, with the central feathers being a dark ashy grey. The rest of the under parts are a pale ashy-grey fading to white in the lower regions. 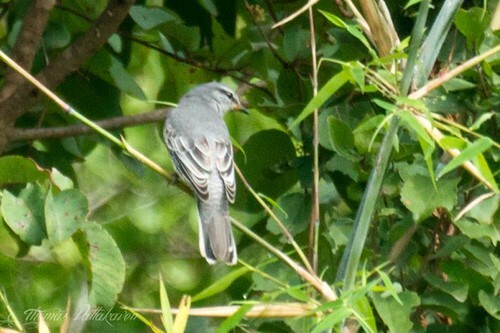 The female, is a paler ashy grey, with the feathers barred paler or darker grey. 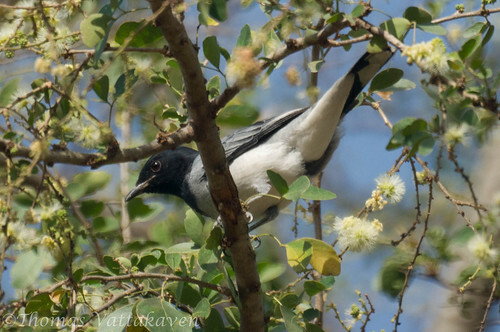 The lower parts may be barred with black and white. 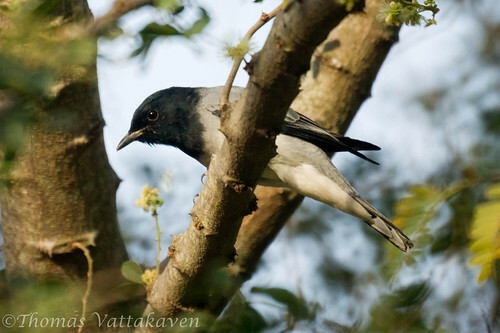 This bird prefers trees surrounding villages and can be spotted in avenues of roadside trees orchards and gardens. It almost never descends to the ground. They are usually found in small parties which fly from tree to tree, hunting for insects and larvae, which makes up its food. 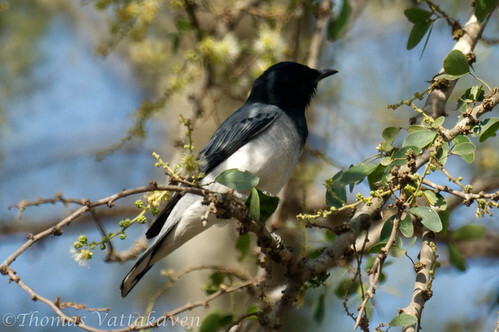 The breeding season is usually between April to May, in the south. The nest is made of twigs and roots and placed in the fork of a branch or the junction between the branch and tree. Other Details: Male seen in a tree foraging for food. Female spotted on Sept 18th 2011 at Sivanahalli.